You can get rid of that fat-free cookbook collecting dust on the shelf. You are not going to find fat-free in any of my programs or blog recipes. This post comes straight from my Healthy Living Program. It is such an important part of your health that I’m sharing it with you today. Fats have been given such a bad rap, but healthy fats are essential to whole body health, so it’s about choosing the right fats, not eliminating them. You can fight body fat by eating the right healthy fats and eliminating or at the very least avoiding unhealthy fats. Doesn’t that sound great? Fighting fat with fat…awesome! Good fats support the function of your cardiovascular, immune and nervous systems. Good fats also encourage proper absorption of certain nutrients and play a crucial role in repair and recovery, and helping reduce inflammation in your body. And, they help remove your body of cholesterol, therefore keeping your cholesterol levels balanced and artery walls free from build up. They also help keep your skin and hair healthy and shiny – a sweet little bonus. When it comes to losing weight adding healthy fats to your meals will keep you feeling fuller longer, preventing you from eating any additional, unwanted calories. Fat travels very slowly, which means it takes a while to digest, keeping your appetite satisfied for longer periods. Having a healthy fat with your meal will slow down the digestion of carbohydrates, which will prevent blood sugar spikes and crashes. This means you will be less likely to crave unhealthy snacks. Just having a handful of unsalted cashews 10 minutes before you eat can cut down how much you eat. 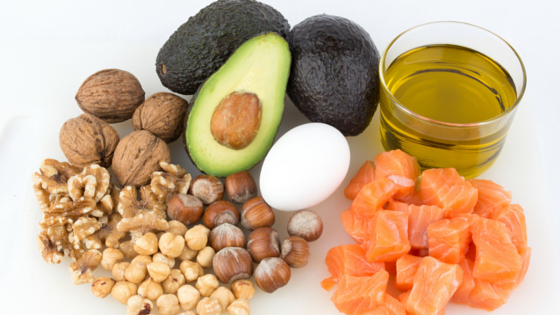 Healthy fats may have so many amazing health benefits, but you want to keep the portions small. Healthy or not, they are still high in calories. 1-2 small servings a day is all you need. That is about a small handful of unsalted nuts or one avocado. You never want to consume more than 30% of your calories from healthy fats. This will help you maintain your weight. There are three healthy fats you want to consume: monounsaturated, polyunsaturated, and omegas. Monounsaturated and polyunsaturated fats are generally found in plant-based foods, which is what makes them so great to eat. You can never go wrong with food made by Mother Nature. The next way to maintain your weight and your health, especially your heart, is to avoid, or at the very least, limit unhealthy fats. The two fats you want to avoid are saturated fats and trans fats. Trans fat is the worst kind of fat. This fat lowers the good cholesterol in your body and raises the bad, all while creating unwanted fat in your body. When buying packaged foods, look at the label. You want to aim for foods that have no more than 4 grams of saturated fat and always avoid partially hydrogenated and palm when you see them on the label. These are fancy other words for trans fats. Now that you know what fats to eat and what to avoid, you can start to swap out the bad for the good. Below are some healthy fat swaps for you to start incorporating into your diet. Swap cream-based soups for broth-based soups. Cream-based anything is full of saturated and trans fat. Treat cream-based soups as a treat, and not as a regular part of your weekly meal plans. Replace bottled salad dressings for homemade salad dressing made with extra-virgin olive oil. Not only will you be just adding healthy fat, you will be avoiding all the other not-so-good ingredients that are found in bottled dressings. For example, sodium, sugar, and artificial flavors and colors. Make sure that the nuts and seeds you buy are raw and unsalted. You are no further ahead if the nuts and seeds you eat are salted and roasted in oil. You can season them yourself. Swap margarine for real butter. Margarine is never a good choice. It is essentially an unhealthy food. It can’t even really be called food because it so processed. If you love to bake, and you are going to bake with butter, use real butter instead of margarine. The more natural the source, the better. Just make sure you eat it in moderation. Baked goods are a treat. Oh, and never, ever eat Becel. You are better off to eat the container that it comes in. Swap ice cream for homemade banana ice cream (see recipe here for a tasty treat). Swap deep fried foods for baked. Baked is always the better choice. When baking foods, use olive oil or coconut oil. Coconut oil has a high heat tolerance. Swap cream based pasta sauces for olive oil, or tomato based pasta sauce. As I mentioned above, cream sauces are full of unhealthy fats and loaded with calories. Also, because of the cheese, they are high in sodium. There are going to be times when you eat a food that is made with an unhealthy fat, or a simple carbohydrate. Something to tell yourself is that these foods should be regarded as treats and not part of your healthy diet. As long as you see them as treats and only have them occasionally, you will be able to stay on track. I’m only human and I enjoy a bowl of chips, or a plate of French fries. This is okay because I know it is a treat and my next meal will be a healthy one. I’m not an all or nothing type of girl. That would be boring and I don’t want that for myself or for you.